OLYMPIA - More upriver fall chinook salmon are returning to the Columbia River than any time in the past 75 years, so Washington and Oregon fishery managers are expanding sport fishing options below Bonneville Dam beginning Sept. 13. Allow anglers to continue fishing for chinook salmon through the end of the year in all areas of the mainstem Columbia River below Bonneville Dam open to salmon fishing. Expand the area open to chinook retention by moving the lower boundary from Rocky Point 16 miles downstream to Buoy 10 near the mouth of the Columbia. Allow anglers to catch and keep up to two adult chinook salmon per day as part of their catch limit below Bonneville Dam. Through Sept. 30, only hatchery chinook with a clipped adipose fin and healed scar may be retained downstream from the Lewis River. Allow anglers aboard a vessel in the Columbia River from Buoy 10 to the Highway 395 bridge in Pasco to continue fishing until the daily limit of salmon/steelhead for all anglers aboard is achieved. Guy Norman, southwest regional director for the Washington Department of Fish and Wildlife (WDFW), said the new rules are designed to give anglers a chance to reap the benefits of a record-breaking salmon run, while continuing to provide protection for wild fish. Based on the latest forecast, 664,000 to 835,000 upriver bright adult chinook are expected to return to the Columbia River this year, well above the record of 420,000 fish set in 1987. On Sept. 7, more than 48,700 chinook from a variety of upriver stocks crowded up the fish ladders at Bonneville Dam, setting a new daily record. That record was broken two days later when 63,870 upriver chinook moved past the dam, followed by 56,044 the next day. "This will be a fishing season to remember," Norman said. "This year's run of upriver fall chinook is through the roof, and a positive sign that regional efforts to rebuild this salmon population are making a difference. These new rules will increase fishing opportunity for anglers, while providing protection for the wild fish returning to the lower Columbia tributaries." The requirement that anglers release unmarked chinook below the Lewis River is specifically designed to protect wild chinook salmon now returning to tributaries of the lower Columbia, Norman said. 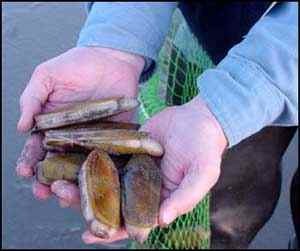 Anglers fishing the big river are required to use barbless hooks to facilitate the release of fish that must be returned to the water. Starting Oct. 1, anglers fishing that area may retain either marked or unmarked chinook after most of the wild tule chinook have moved out of the mainstem Columbia. "We might have already seen the peak of the run at Bonneville, but there still will be good fishing in the lower Columbia River during the weeks ahead," said Joe Hymer, a WDFW fish biologist. "Meanwhile, this year's huge run is starting to show up in fisheries hundreds of miles upriver." Hymer noted that 92,000 fall chinook have already crossed McNary Dam south of the Tri-Cities and 26,000 have been counted at Ice Harbor Dam on the Snake River. 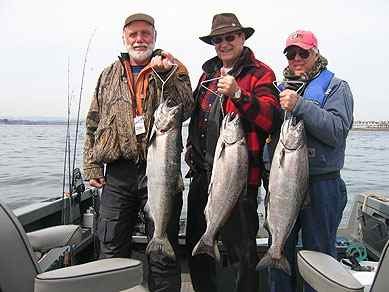 Anglers fishing below Bonneville Dam can retain two adult salmon, two adult steelhead or one of each as part of their daily limit. Fishing rules vary further upriver and anglers are encouraged to check WDFW's Sport Fishing Rules pamphlet and Emergency Rule website at WDFW's Sport Fishing Rules for details.